From my recollection, doctors were the first to try this nonsense. They would slip in a provision in all the intake paperwork, stating that the patient agrees not to post any negative reviews about the doctor, with a $500 penalty if the patient violates the clause. These contract clauses gained more and more popularity. I came across one in the repair estimate I received from my Ford dealership. 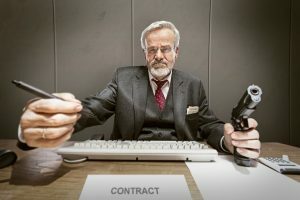 Occasionally, I would receive a call from a doctor or some other business, asking me to write a letter to a customer, demanding that they take down a review based on such a contract clause. I was happy to demand removal if the posting was defamatory, but I would not agree to use the clause as a basis, because I found them so offensive. Apparently the California Legislature found them offensive as well, and created Civil Code section 1670.8. This section makes it ILLEGAL to include one of these “you can’t review me” provisions in any contract. If a business includes such a provision in a contract, it can be hit with a penalty of up to $2,500, and $5,000 for each subsequent violation, even if it never seeks to enforce the provision. If you encounter a contract with “you can’t review me” language, then contact me immediately. I’d love to take these to court. 1670.8. (a) (1) A contract or proposed contract for the sale or lease of consumer goods or services may not include a provision waiving the consumer’s right to make any statement regarding the seller or lessor or its employees or agents, or concerning the goods or services. (2) It shall be unlawful to threaten or to seek to enforce a provision made unlawful under this section, or to otherwise penalize a consumer for making any statement protected under this section. (b) Any waiver of the provisions of this section is contrary to public policy, and is void and unenforceable. (c) Any person who violates this section shall be subject to a civil penalty not to exceed two thousand five hundred dollars ($2,500) for the first violation, and five thousand dollars ($5,000) for the second and for each subsequent violation, to be assessed and collected in a civil action brought by the consumer, by the Attorney General, or by the district attorney or city attorney of the county or city in which the violation occurred. When collected, the civil penalty shall be payable, as appropriate, to the consumer or to the general fund of whichever governmental entity brought the action to assess the civil penalty. (d) In addition, for a willful, intentional, or reckless violation of this section, a consumer or public prosecutor may recover a civil penalty not to exceed ten thousand dollars ($10,000). (e) The penalty provided by this section is not an exclusive remedy, and does not affect any other relief or remedy provided by law. This section shall not be construed to prohibit or limit a person or business that hosts online consumer reviews or comments from removing a statement that is otherwise lawful to remove.